Ask fellow campers about "Icelandic State Park" and nearby attractions. ONLY reason we couldn't give this gem a 10 was because of 2 small items - 1. No sewer connection, 2. narrow (but paved) roads. Were there for the max 14 days, which meant that every 4/5 days, we had to unhook and drive our coach to the dump station along the narrow, winding roads, a bit of a pain. 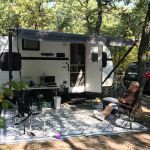 Otherwise, Icelandic State Park was a really great place to camp, the campground itself is on the banks of Lake Renwick and Renwick Dam on which boating and fishing was allowed. There is also a very nice beach and concession. Icelandic State Park had many sites, mostly pull throughs which were paved and mostly level (ours was perfect), there were plenty of trees ad manicured grass areas making the whole park quite pretty. The Bathhouses were always spotless, plenty of hot water! Also on the grounds of Icelandic is a fascinating museum called the "Pioneer Heritage Center" with exhibits from the Homesteading days and the original Gunlogson family Homestead. With this museum was a number of original and restored buildings, some from the original homestead and others brought from other areas nearby. Of nearby, the pretty little town of Cavalier is just 5 miles down the road with 2 supermarkets and a hardware store. If you're in this part of beautiful North Dakota - do not miss this park! We WILL be back. Other attractions about 10/15 miles away was the little town of Walhalla on the way to beautiful Pembina Gorge, there is a Ski Resort which has a summer theater called Frost Fire - well worth the visit. Also, only about an hour away, is the beautiful and interesting city of Winnipeg across in Canada. There is really so much to see and do around Icelandic State Park! We camped at Icelandic State Park in a Motorhome. Icelandic State Park is near so much, across the road was another fascinating and interesting, Pembina County Museum, up highway 5 about 6 miles was a Missile Site #3, left over from the Cold War and now owned by a private individual who is restoring it and giving guided tours. Beautiful state park with private sheltered, shaded sites. Small lake in the park. Frostfire, a nearby summer theater in Walhalla, ND puts on a nice community show every summer. A local foundation is working on developing the Pembina Gorge, a unique gorge in the middle of the flat Red River Valley. The park also has an historical display of Icelandic culture. We camped at Icelandic State Park in a Fifth Wheel. We were camped in the north loop on the inner part of the loop. The water hookup was at the back of the site which is on a shared pedestal. The electric hookup is in an odd spot right outside the door of the trailer. The showers are free of charge and clean. There was a small beach with a concession stand and a fishing dock near the primative camping sites. There is also a interesting museum at the Pioneer Heritage centre with a small gift shop. We really enjoyed our stay at this park and can't wait to go back. The only negative was there is no sewer so long stays not practical for us. We camped at Icelandic State Park in a Fifth Wheel. The campsites are well spaced and have shade. Most do not have level parking areas (slightly inclined), so bring some boards to level your RV. Although there are no lakeside RV campsites, the beach area is very nice -- and just a short walk. We camped at Icelandic State Park in a Motorhome. 20 is nightly fee but there is a $4 reservation fee and a daily vehicle permit fee. $54.00 for two nights and it was worth it. Park was virtually empty as we stayed on a Tuesday and Wednesday. Great playgrounds in several areas of the park. Big Rig friendly (our 40' motorhome fit well). Would have been a 10 if the water wasn't located at the back of the rig and we needed a short extension. You can swim in the lake and picnic on the tables nearby under the trees. This park is just beautiful. No sewer but there is a dump. At this time they are doing construction at the main entrance. You will need to take a gravel/dusty detour but the park is worth it. We camped at Icelandic State Park in a Motorhome. The good news is every RV site is a pull through! The bad news is the shared water faucets. If you can get a spot in the West loop (which is 100% first come first serve), you get your own water faucet. Both the South Loop (100% reservations only) and the North Loop (part first come, first serve, part reservation only) have shared water faucets, one faucet between every other site. You will need 50 feet, maybe more, of hose. But the good news is there are two water faucets on the shared pole. So, you won't have to negotiate with your neighbor over using a splitter. Water irritation aside, this is a great park! The spacing between each site is adequate, the acreage per spot is adequate. There are plenty of trees for shade. Although every spot is a pull through, the bad news is the spots on the right of the driving road are easy to get into. The spots on the left of the driving road require either that you make a 180 degree U-Turn to get in, or that you turn around and approach the site from the other direction. Basically, this means you can drive both directions on the driving road, but the driving road is not wide enough for two lane driving. YIKES! The third alternative is that you can just pull in with a left turn, and put up with the hookups being on the "wrong" side. There are some "double" sites for buddy camping in each loop. If you can get one of those, the "shared" water faucets are more conveniently located. There is a beautiful primitive tent area with adequate spacing and adequate shade for tents. There are also three "park here, hike it in there" tent sites near the lake. You don't have to hike too far. Those sites have the best shade. Swimming pool had been marked "yes," but I changed it to "no." There is no swimming pool, but there is a "no lifeguard" swimming area in the lake. Also, plenty of playgrounds for children. During the summer, there is a concession stand with pizza and ice cream on weekends only. If you have the North Dakota annual pass, the rate is $20. Without the pass it's $25. Good TV reception of a few channels over the antenna. Good reception with Verizon cellular modem, cell phone, and "Home Phone Connect" service. I would love to give this park a 10, but the shared water faucets requiring 50 feet or more of hose, and the "not wide enough for two lane driving but two lane driving is still allowed" driving road make me only give it an 8. We camped at Icelandic State Park in a Motorhome. This is a very well maintained State Park. The lake is a man made lake and therefore is not the biggest body of water and it's popular with people looking to water-ski, jet-ski etc. All the sites in the main campground are pull through sites and are of good size with grassy areas on each site. The park has 3 different modern washroom buildings in the campground area. So well laid out and maintained the park is very enjoyable. Almost so much so that it's becoming tougher and tougher to even get sites during the summer weekends. We camped at Icelandic State Park in a Travel Trailer. Beautiful place, the museum and trails are great. It's big enough to use the bikes and don't forget the Pembook Museum across the road with many, many restored vehicles and tractors. Would return in a heartbeat. We camped at Icelandic State Park in a Fifth Wheel. Very beautiful campground that is kept up immaculately. Swimming beach is great for the kids. Very impressive fishing pier with railings around it (keeps young kids at bay) and quite a few small perch that keeps kids interested. We camped at Icelandic State Park in a Travel Trailer. Are you affiliated with Icelandic State Park ?